Projector screen rentals are always synonymous with the word ‘’complicated’. Yet, when you use a projector screen, it will give a completely different dimension to your event – if you utilize it right. In this article we will talk about the benefits of projector screen rentals, what you need to watch out for, and, of course, what the major no – no’s are when it comes to renting a projector. When you are organizing a big corporate event or a business meeting, you want to leave a lasting impression. The better the impression, the better it will be for your own business. It will result in more opportunities and contacts. So what are the main ingredients of the perfect event? Interesting guests that will instantly grab everyone’s attention with great topics? Check! Great venue? Double check! But another important aspect that will greatly increase your event’s impact is the equipment. You don’t want to skip this step! Imagine the horror if you have great guest speakers that people have come to see and then the AV equipment and projector screens fail. The frustration and disappointment will tarnish your reputation and experience. Decide: what do you want to accomplish? Are you organizing a big corporate event? Business training? Organizing a dinner party or an outdoor event? Do you know what your objective is? Good. The next thing you need to know is the message you want to share with the audience. Based on your needs (venue, number of guests, guest speakers, etc. ), you need to think before you act. Deciding how to best communicate your message is key to the success of your event. People respond to visual aids really positively. They will always fall in love with what they see. Use this to your advantage. Take it from us: what every successful event needs is a projector screen. We will help you learn how to select the best option for you. There are a few important details to consider when choosing the right projector screen for your event. What is the most important aspect to think about when it comes to projector screen rentals? The size of the space you are renting is the first step to consider . Every detail matters, no matter how tiny or unimportant it seems: size, audience placement, light, windows, light fixtures, etc. Think about your expected attendance. Where will they be during the presentation? The bigger the audience, the bigger the challenge. 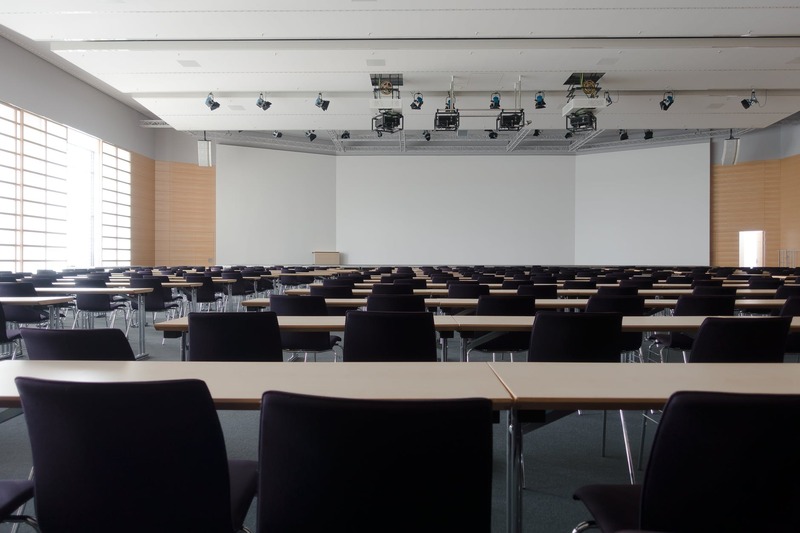 The size of the audience will help you determine your projector screen rental needs. Small-to-medium audiences will be served well with a projector around 3500 lumens. Larger audiences require more – you will need at least 5000 lumens in your projector. Let’s be even more precise. For entry-level boardroom projector, use 2500 + lumens, High Brightness. For a Boardroom Projector, try 4,000+ Lumens. A Conference Projector should have 5,000+ Lumens, High Brightness, while a Conference Projector excels with 7,500+ Lumens. Finally, for a large venue/Event Projector, always use 10,000 – 20.000+ Lumens. Ambient light and presentation are also critical when it comes to planning your perfect presentation. Ambient light determines how bright your projector must be. In consideration of your presentation – will you be using a slideshow, video or a Powerpoint? If you want a more detailed image, we recommend using the higher resolution. Detailed content (i.e. spreadsheets, web pages etc.) will look better on high-resolution projectors and resonate more clearly to your audience. The next important thing is connectivity. Be ready for every scenario possible. Make sure that all the devices you have are compatible and always test them before your audience arrives. The most popular ways to connect to a projector are by using HDMI & VGA cables. HDMI cables can handle high-definition signal and provide you with amazing audio. VGA is always a popular option and there are few other types to consider like SVHS, Composite, DVI, RGBHV & HDBaseT. Now let there be sound! You need quality speakers to reinforce your great presentation! If you are happy with your old home speakers, that is fine. But you are missing a great opportunity to amaze your audiences. If you need to serve a larger audience – think big and invest in stereo sound. Portability is the final recommendation we offer. You need to find a light and practical projector that you can easily transport. What are the major benefits of projector screen rentals and what should you skip? Fast-paced technology upgrades. Technology is changing and evolving in the blink of an eye. Before we realize it, our technology becomes obsolete. A new model will always be waiting around the corner. So, why waste your money when you can rent a brand new model? Enjoy great and modern features as they are developed! It will also leave an impression of you being a young and tech-savvy company to your visitors. Projector screen rentals are practical in many ways, so let’s see what other major benefits exist when it comes to renting top-tier equipment. Cost. It is more cost effective to rent instead of buy. Let’s face it, a projector is not something you will use on a daily basis. It is for special occasions only. So, why bother spending all of that money? Also, renting is very practical – you can choose the best options, compatible devices, and connectivity speeds for what you need each time. You will always have the best combination for the best results. Flexibility. If you own one projector, you are limiting yourself and your potential presentations. Every event is different and one projector can’t do everything. It’s time to discover the beautiful world of customization. Storage. There is never enough space. With rentals, you don’t need to worry about correctly storing a projector screen. Just let professionals from the rental service do their magic. Save space and time with a rental service option. Maintenance expenses. Finally, just like any other equipment, projectors need careful maintenance in order to stay in optimum condition. Why waste money on maintaining something you only use on rare occasions? Renting a projector will clearly save you a lot of money and your audience will be amazed by the sound, sharp image, and brightness.